This is a great example of the way that a book changes, based on you (the reader). I first read Michael Perry's Population: 485 when it was released, way back in 2002. At the time, I had been a city girl all my life, and I still was - I was living in West Seattle, battling traffic across to the eastside every day. It struck me as an interesting look at a wacky small town. An entertaining read, to be sure, but I didn't really connect with the book on a deeper level. 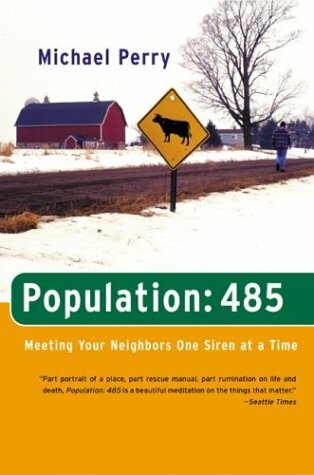 Population:485 is first and foremost the memoir of a First Responder. Perry is a volunteer firefighter, along with his two brothers. His mother is a physician and EMT. When there is trouble in this small Wisconsin town, the Perry folk are on the scene. The memoir skips between his early days as an EMT and more recent times in the small town he has made his home again. I had some difficulty following the timeline, not that it really matters. The book is essentially a collection of essays of varying lengths, some of them little more than anecdotes. This makes for excellent reading in small moments, although it frustrates any attempt to tease out a larger narrative. I found myself thinking how many narratives could be written about New Auburn, Wisconsin. 485, at least. But Perry's gives an unusual perspective to small town life: all the ways that things can and do go wrong. The freak accidents, the drunk drivers, the heart attacks and babies that can't wait until they get to the hospital to be born. If there are any other memoirs about being a first responder in a small town, I haven't heard of them. It's a unique perspective on small town life, and one which avoids the usual traps of sentimentality (apple pie; open entry parades) while occasionally slipping into others (the delicate line between life and death). It's well worth the read, if only because it will probably convince you to wear your seatbelt at all times.